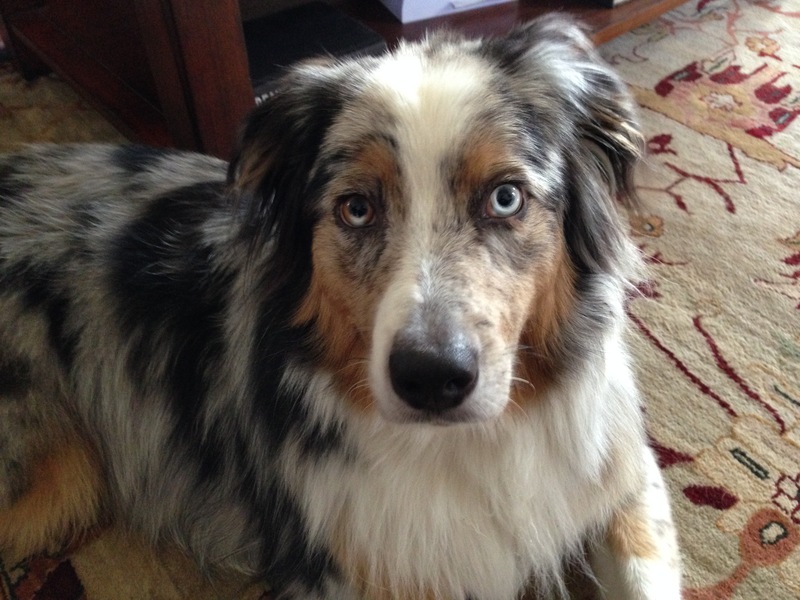 Bowser is a two-year-old Australian Shepherd who gets so excited one walks he can’t control himself; pulling on the leash and barking, especially if has seen an animal in that location on the walk before. Also barks when people come in and out of the house which a lot of late night traffic. While he is a smart well trained dog, it was clear that the leader follower dynamic in the home wasn’t where it needed to be. To help change the way the dog see’s his authority in conduction with the humans, I showed his guardians a leadership exercise I developed a few years ago. The exercise asks the dog to ignore a high value item placed in the middle of the floor after the human claims it in a similar fashion to how a dog would. In addition to helping the dog practice restraining itself, it teaches the human how to establish and enforce boundaries. I only had to run through the exercise twice before Bowser was ready for him guardians to run through it on their own. The first guardian to go through it had good technique and timing, but the dog’s second guardian had a little trouble starting out. Dog claim things by standing over the item, so the exercise is supposed to involve the human dropping the treat between their feet. But the second of Bowser’s guardians to run through the exercise held the treat out then placed it in front her her rather than between her feet. After giving the guardian a few pointers on the exercise, she nailed it on her second attempt. Next I had the guardians call over a neighbor so I could show them how to use some of the techniques form the leadership exercise to claim the area around the front for when guests arrived. I had his guardians move to a spot where they could watch as I ran through it the first time myself. Bowser rushed the door as soon as he heard the knocking, but I was able to move him away using my own movement and body language. His guardian had a little difficulty at first, but eventually she was abel to get the dog to move back about seven feet from the door before she opened it. At first she was a little timid in her movements, stopping before she got to the dog rather than walking through it. But as she progressed, she got a better reaction. She was doing great until the last little bit. She made a crucial error by shifting her eyes and body in a way that caused the dog to think she was no longer asking him to stay back so he got up and rushed the door. In the future, keeping one eye and some of her front facing the dog will prevent that from repeating again. In time, the dog will learn to stay back on his own and let the humans handle the door greetings. Now it was time to tackle the big issue, Bowser’s walks. I had the guardian show me how they got him leashed up so I could get a feel for the baseline. As soon as they said “Ready to go for a walk,” Bowsers energy level went way up. I called him back and we ran through it again, but this time without any narration. This time the dog still got excited, but it was considerably less than the initial attempt. We ran through the process eight times, stopping the instant that the dog started to get excited. By repeatedly stopping and starting over when the dog got excited, we were able to communicate that the only way we would continue, is if the dog remained completely calm and waited for his guardians to get up and go out the door first. While getting leashed up got Bowser excited, his guardian told me that it was walking to and passing through the fence that triggered his second burst of excitement so we practiced disagreeing and correcting the dog the instant it started to show excitement. I also pointed out when the guardian put tension on the leash as most dogs will automatically pull against a tense leash. As we neared the end of the block the guardians let me know that we were approaching a house Bowser got crazy at. The dog pulled a little father out front that I would have liked, but instead of crazy Bowser, he didnt really react at all. After running into a few dogs where Bowser was able to remain calm and collected, we continued for another few blocks. At the half way point, we swapped guardians so his other handler could practice her leash work. Because she was a little too soft and late in her corrections, the dog started to pull ahead so we stopped and I showed her how to define how far ahead the dog was allowed to go. The dog’s job is to probe to see how far it can go until being corrected. By correcting the dog with good timing as soon as it moves too far ahead, we can help it learn to stay in the heel position. As we walked, her timing and technique improved quite a bit. I wanted to up the ante a little so we went back to the complex on their block that usually provoked one of the stronger reactions from Bowser and this time, we didm trust walk past. I had her walk up into the courtyard and around a center island. Even when a dog that Bowser normally reacts to barked, his handler was abel to keep him so calm and well led he didnt react at all. Bowser isn’t a aggressive dog, he was just confused as to his place in the family and his tendency to get over excited prevented him from being able to control himself. Now that his guardians know how to communicate what they want and lead him, Bowser will learn to stop being so reactive and let his guardians handle things.